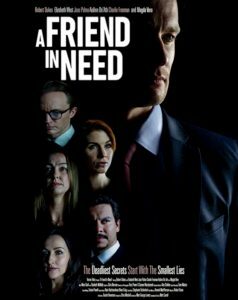 Robert stars as Chris in new short film A Friend In Need, a thriller about three brokers who’ve been lying to their wives – but whose extracurricular activities come back to haunt them. It’s a taut film with a running time of 35 minutes, enough time to develop the characters and add some twists and turns. 1, How did you get involved with A Friend In Need? Was it a straightforward casting or were you involve from the beginning? Pretty much a straightforward audition to be honest! A friend of mine in Australia messaged me to tell me about the auditions, so I emailed the director and he asked me to audition for Chris and Patrick, two very different characters. I did my self-tape for Chris first and felt so strongly about his character that I didn’t end up reading for Patrick. Bit of a gamble but luckily I got the part! 2, Do you find that the best way to get films made is by simply making it happen yourself with like minded actors, directors and crew? I really love the process of auditioning; it’s an opportunity to practice the craft and meet new people, which I love. When I get the chance to play the part I auditioned for, it gives me such an adrenaline kick to know that I’ve given the casting director and director what they were looking for. 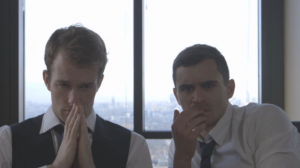 When I first moved to London I didn’t know any production people, so out of necessity I made my own films – actor friends would put me in touch with camera ops and directors and we’d make a short. Luckily my day job was in post-production so I had friends that would edit too. Since then I have continued to make my own projects from time to time, and whenever I’m on a job and I hear production are looking for a certain role to be filled I can offer up suggestions. I’m very lucky to have incredibly talented friends in all areas of the business, I love being able to bring the right people in for the job. I want our project to be as good as it can be so if there is anything I can do on top of my job as an actor I’m always happy to do it. 3, Short films are often adverts for “as yet unmade feature film versions” of the same (or similar) story. Is that the plan with A Friend In Need? It works as a short but would also make a good taut feature-length thriller. Thank you! That is something we are developing. Using the short to build on, we are hoping to secure funding for a feature length version of our story. I’ve been working closely with the writer, workshopping ideas for the characters and taking the story further. I’m really enjoying seeing where we can go with these characters, all of them have been developed beautifully. Having a feature run time means we can explore ideas and avenues that are simply not possible in a short, giving far greater depth to the narrative. Ha! They are definitely beautifully flawed characters. That is an interesting question, but no, I didn’t base Chris on anyone in particular. My job is to find the similarities between myself and my character and go from there. 5, Did you like Chris? What did you see in him that you could work with? Yes, I do like him; he’s innately human. I have to sympathise with his situation, he’s tumbled down the rabbit hole and doesn’t know how to get out. I believe that deep down he’s a good man who loves his family, which is something we are developing and working on for the feature. Everyone makes mistakes and Chris is no exception. The cold made our second day extremely difficult but it gave us something extra to work with – the boys who went through those situations had conditions that would have made ours look like a holiday camp. But it was good to be able to use the cold and wet to our advantage. Tough but rewarding sounds about right. To be honest I think we all loved every second. 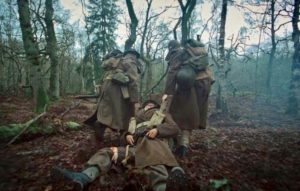 There is a sequence where Kevin [Leslie, who plays Will, one of the brothers] and I are running from German soldiers, zig zagging in and out of trees, through mud and boggy water. The exhausted looks on our faces didn’t require any acting. We used live explosives on set too, which was a first for me – the adrenaline kept us warm! It was a very different shoot that’s for sure. 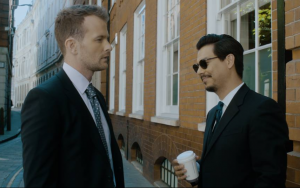 The Code was shot in January. We shot all the forest sequence across three days and then did the dance hall section in February I believe. So we had a break of about three weeks between shoots. Principal photography for A Friend In Need happened over seven consecutive days on the hottest week of June last year, the weather couldn’t have been more polar opposites! It was lovely being able to shoot at “Emma and Patrick’s” place for the BBQ, we actually had a BBQ in the evening sunshine once we were wrapped for the day! The biggest issue we faced was make-up melting off actors’ faces and avoiding sunburn! 8, What pushed you in the direction of acting? Have you always wanted to act or is there a film or performer which transformed you when you saw it or them? I saw Star Wars at about 8 years old and I just remember thinking I wanted to tell stories and have adventures like the actors in the film. From that moment on I knew what I wanted to do. That being said, my first foray into performing was earlier than that – I grew up playing the trumpet and I was in many different groups, orchestras, wind bands, ensembles, jazz and big bands. In fact I did so much music throughout my teen years I had to beg my teachers to let me be in the school plays and not in the orchestra. 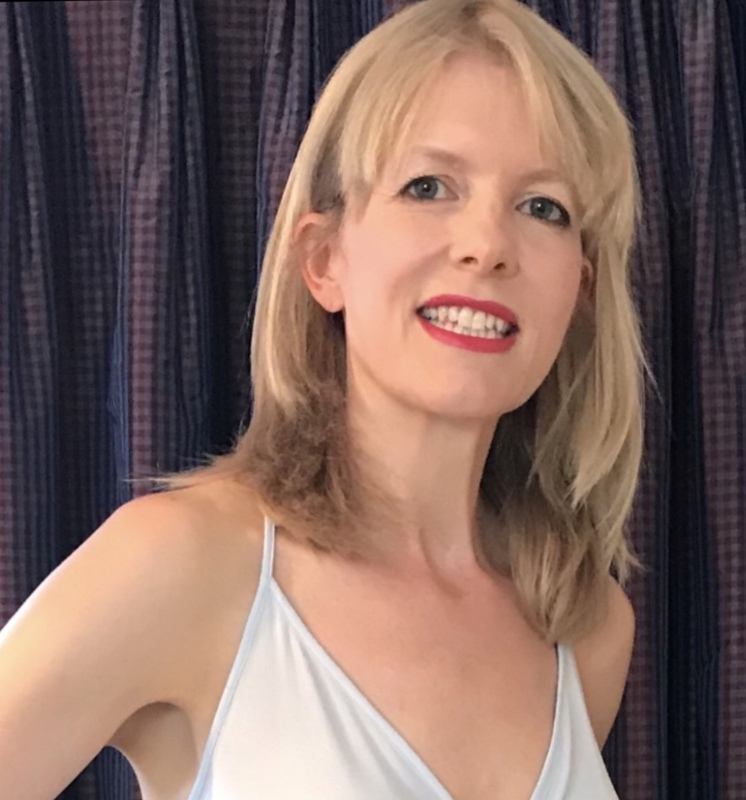 After university, I actually stopped acting for a number of years and it wasn’t until I met an actor I admired in person and chatted to them that I got my act back together and began training and working again. As for a particular performer that inspired me? There are too many to count! 9, Acting is notoriously competitive and hard on self-esteem. How do you manage friendships with other actors when the ebb and flow of acting means one of you may be going up while the other is temporarily treading water? It must sometimes be difficult, whichever position you are in at that point? I have a lot of friends who are actors, I used to compare myself to them, but it kills you. I learnt a while ago now, the only person you can compare yourself too, is you. Everyone is on their own unique path, with their own skills, characteristics and drive, that’s what makes this job so brilliant – everyone is different. Just do you, be happy for your friends’ successes, celebrate them and be there when things don’t go to plan. If you’ve got a good group of people around you, they’ll be there for you during the highs and lows as well. I’m very lucky to be married to an actor and we’ve always found that when one of us on the up, the other is indeed treading water. We talk about being a slingshot for the other person, we share in each other’s triumphs and lows. Social media is a wonderful tool, a great way to connect with people, showcase your work and share your journey. But it can also be awful because what people post is designed, planned and thought through to be the most impressive thing possible; it’s impossible to live up to perfect standards. Again, the only person you should be competing with is yourself. 10, Okay, culture! What was the last: book you read / film you saw / music you listened to… and were they any good? 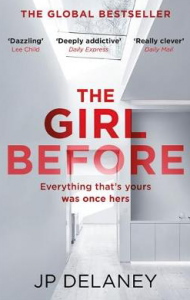 Last book I read: The Girl Before by J.P. Delaney, which was a tense thriller that intersects both the past and the present. It’s great and I’d be amazed if Hollywood hasn’t already bought the rights to it. I’m currently reading two though: Sapiens: A Brief History of Human Kind by Yuval Noah Harari and The Last Gunfight by Jeff Guinn. Last film I saw: Stan and Ollie, a beautifully made picture which featured some fantastic performances, especially from John C Reilly and Steve Coogan. Last music I listened to: I listen to music all day, every day – I often use it when I’m preparing for a role – I’ve got a playlist for my next film which I’ve been listening to in the gym. My music tastes are quite eclectic, everything from classical all the way to hip hop and everything in between. 11, Film-wise, is there anything coming out that you’re looking forward to this year? I keep hearing great things about Green Book (which also features two actors I admire), coming from a musical background the topic is also fascinating to me. I was enthralled by Whiplash, which reminded me of my time spent in orchestras and bands playing trumpet. I’d love the opportunity to play a musician and pick the instrument again. I’m also looking forward to The Avengers: Endgame – I want to know how this 10 year story arc ends! 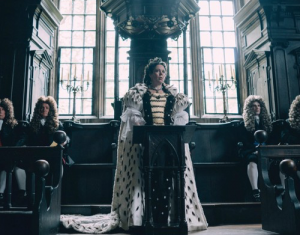 I’m also excited for John Wick 3 (I love the first two), Once Upon a Time in Hollywood (has a stellar cast), and The Favourite (everything Olivia Colman touches is gold). 12, And finally, tell me about your film heroes! I don’t have one particular actor or filmmaker, there are so many that inspire me. I’ve always admired Christian Bale’s tenacity with how deeply he gets into character, Heath Ledger was a huge hero growing up. One of my favourite films is Heat, so DeNiro and Pacino come to mind particularly in that film. Sam Rockwell is astonishing, Olivia Colman is incredible (obviously) and recently I’ve been blown away by Margot Robbie’s work – her performance in I, Tonya has really stayed with me. Emily Blunt’s work on Sicario was out of this world. I also think Ryan Gosling and Carey Mulligan in Drive were wonderful. 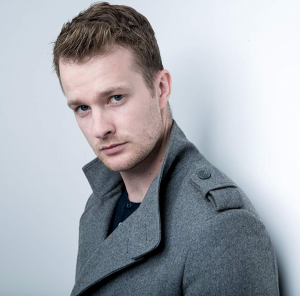 The entire cast of Westworld are simply fantastic – I could go on and on. 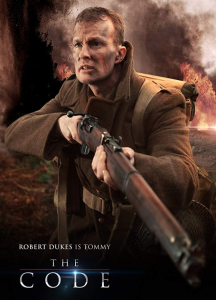 You can read my reviews of A Friend In Need and The Code, both starring Robert. 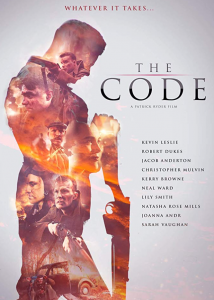 And check out my interview with The Code’s director Patrick Ryder about making the film.